THE OFFICE IS ON THE CORNER OF 14TH ST (US HWY 27) AND CITIZENS BLVD. FROM NORTH OR SOUTH, TAKE U.S. HIGHWAY 27, TURN EAST ON CITIZENS BLVD. FROM THE WEST, TAKE STATE ROAD 44 EAST TO LEESBURG, TURN NORTH ON 14TH ST (US HWY 27). FROM THE EAST, TAKE US HWY 441 INTO LEESBURG AND TURN WEST ON CITIZENS BLVD. THE OFFICE IS ON THE FIRST FLOOR OF THE THREE STORY BUILDING ON THE CORNER OF 14TH ST (US HWY 27) AND CITIZENS BLVD. THE PARKING LOT CAN BE ACCESSED FROM EITHER 14TH STREET OR CITIZENS BLVD . The Leesburg Social Security office is located in Leesburg 34748. The following page includes information for this location like the office phone number, hours of operation and driving directions. If you have any interests or comments about your retirement benefits or are interested in making an appointment, call the following Leesburg Social Security office. The Leesburg Social Security office is located at Leesburg 34748. The Florida SSA contains a variety of federally run programs like retirement, SSI, Medicare and disability benefits. The following page contains helpful contact information for this location such as the Social Security office phone number, hours of operation, and driving directions. 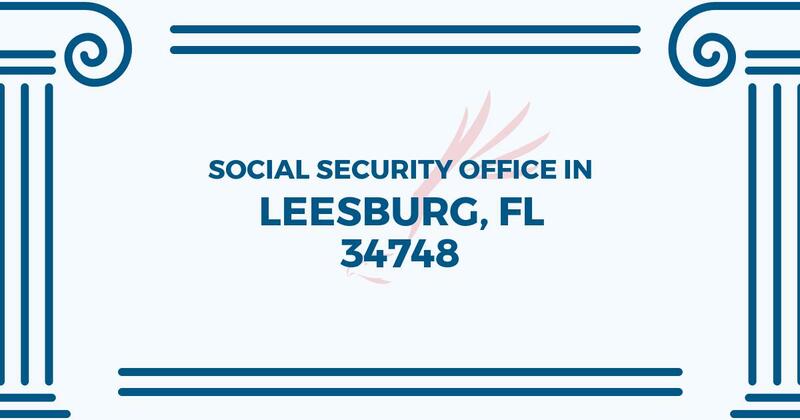 If you have any concerns or requests about your retirement Social Security benefits or interested in planning an appointment, call the following Leesburg Social Security office.